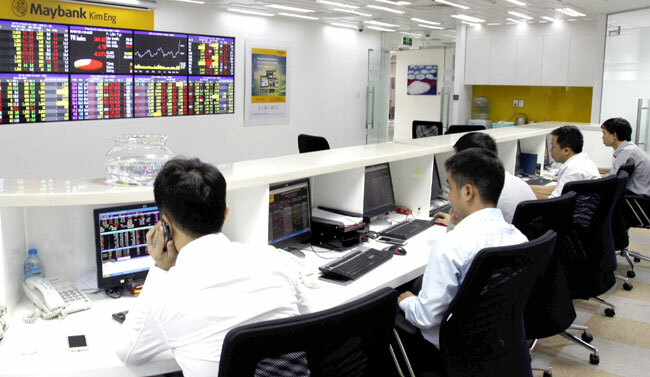 HA NOI (VNS) — Benchmark indices on both the national stock exchanges posted gains yesterday for five consecutive days with improved liquidity. The trading value on both the bourses totalled more than VND3.5 trillion (US$166.7 million), up roughly 26 per cent than yesterday. Despite some fluctuations in early morning trading, the VN-Index on the HCM City Stock Exchange, managed to add 4.81 points closing the day at 588.5 points, or an increase of nearly 0.82 per cent. Gains by major stocks supported the recovery of the benchmark index yesterday, as it steadily advanced in the morning trading session. A total of nearly 162.5 million shares were traded on the southern bourse yesterday with the trading value reaching VND2.5 trillion (US$119 million). With gains registered by 19 blue chips on the VN30 Index, which tracks the 30 largest shares by capitalisation and liquidity, the VN30-Index soared 0.89 per cent to reach 666.61 points. Technology giant FPT Corporation (FPT) gained 5.5 per cent yesterday to close at VND67,000 ($3.19) per share after touching its ceiling price of VND67,500. Saigon Securities on Monday forecast this year's turnover and net profit of FPT to respectively increase by 13 and 14 per cent, adding that in the short term, FPT shares will remain bullish following the regulation about increasing room for foreign investors. After reaching the ceiling price on Monday, Tan Tao Group (ITA) posted a gain of 2.3 per cent to close at VND8,900 ($0.42) per share and continued to lead the southern bourse in liquidity with 9.45 million shares being successfully traded. Other huge gainers included insurance company Bao Viet Group (BVH), Hoa Phat Group (HPG), Hoa Sen Group (HSG), and PetroVietnam Drilling Corporation (PVD). The logistics company Gemadept Corporation (GMD) and Kinh Do (KDC) also registered gains. Among the blue chips, eight codes lost value yesterday. Penny cap stocks maintained their growth yesterday with many codes of the mining sectors reaching their ceiling prices. Overall, on the southern bourse, there were 133 gainers and 97 losers. However, the market highlight yesterday was on the Ha Noi Exchange with the HNX-Index setting a 10-month high and record liquidity. The HNX-Index added 0.83 points, or 1.01 per cent, to end at 83.64 points, while the HNXFF-Index, composed of stocks with a minimum free float rate of 5 per cent, closed at 83.52 points with a gain of 0.81 per cent. The trading value of the capital city's bourse totalled VND1.11 trillion ($52.8 million), only lower than the record liquidity recorded during the historic trading session on February 20, on the exchange of more than 116 million shares. Tracking the top stocks by capitalisation and liquidity, the HNX30-Index ended at 167.13 points or 0.73 per cent higher. A record number of 20.4 million shares of the PetroVietnam Construction Joint Stock Corporation were traded yesterday, boosting the stock to increase 8.51 per cent of its ceiling price.